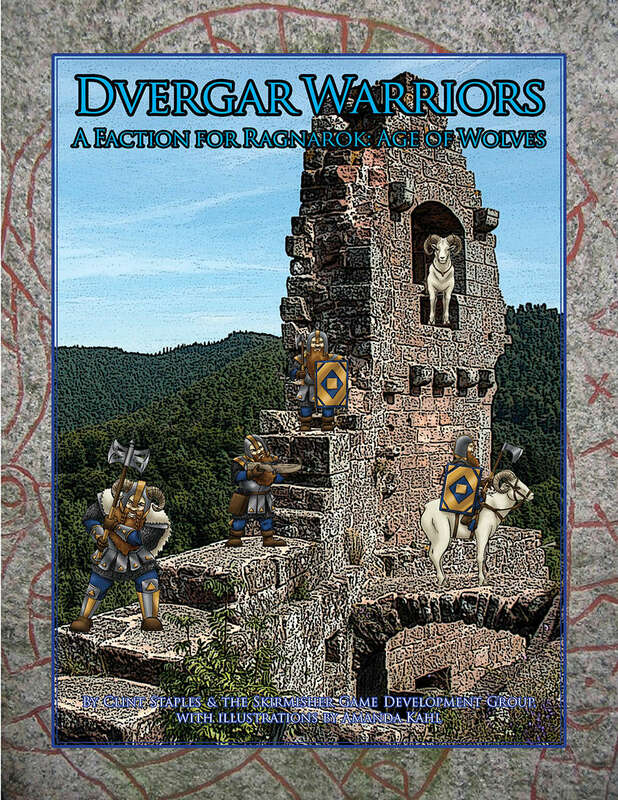 “Dvergar Warriors” is a supplement for the Ragnarok: Age of Wolves miniatures wargame devoted to the Dwarves of the Mythic North that includes seven sets of creature statistics that can be used together to form a complete new faction for the game or in conjunction with those for any other warriors and any sorts of scenarios. They include three named characters, among them those for a chieftain and two of his lieutenants, or thegns, including a wizard and a cavalryman with a magical axe; three different sorts of common warriors, or carls; and a large War-Goat. It also includes backstories for the various characters and for their place in a Dvergar holding called the Yttrsholm; a profile for the Dvergar race; stats for a new weapon, the Dverg-Bow; and a new spell. This book is supported by a set of “Dwarf Soldiery Cardstock CharactersTM”” miniatures that contains three variations on five different figures and a set of “Dwarves: Tokens & Avatars for Virtual Tabletops.” Contents of both of these sets correspond to the stats provided in this book and can be used with Ragnarok: Age of Wolves or any other tabletop or roleplaying games. With nearly limitless resources at its disposal, the Galactic Empire is capable of creating all kinds of unimaginable weapons. But not every problem can be eliminated with a single blast from the Death Star’s immense superlaser. Some missions require a more delicate touch. When high-ranking Imperial officers like Director Orson Krennic need a scalpel instead of a cudgel, they turn to the Imperial Death Troopers. Trained in multiple forms of combat and proficient at erasing their involvement from operations, these elite soldiers are a terrifying sight to anyone unfortunate enough to stand in their way. 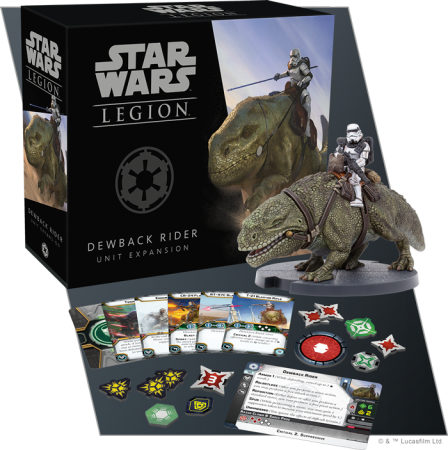 You’ll soon be able to have your own squads of Death Troopers do your bidding on the battlefields of the Galactic Civil War with the Imperial Death Troopers Unit Expansion for Star Wars™: Legion from Fantasy Flight Games. 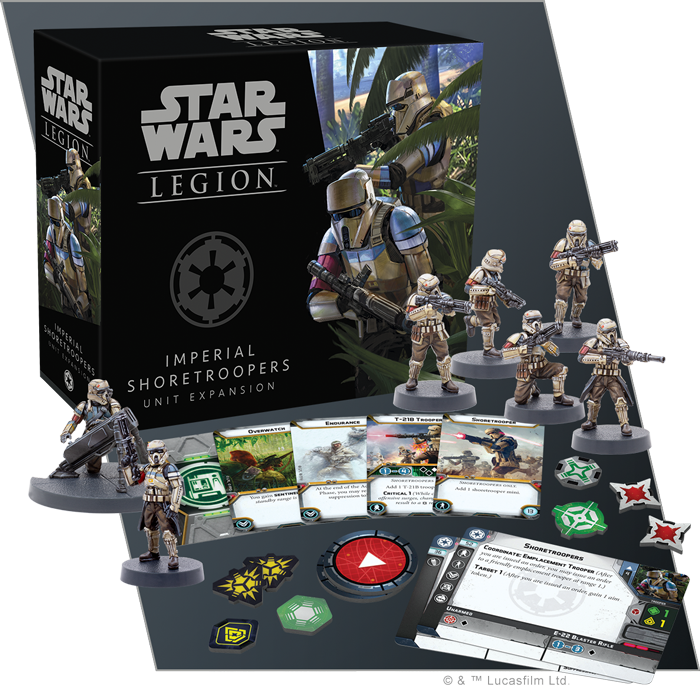 Within this expansion, you’ll find six unique, highly detailed, unpainted Imperial Death Trooper miniatures for you to add to your collection, including four troopers prepared to carry out any mission with their E-11D blaster rifles. Meanwhile, the Death Trooper designated DT-F16 and a DLT-19D Trooper can bring even more firepower to the unit. Finally, you can make full use of all your Death Troopers’ training with eight upgrade cards that give them access to more gear and comms equipment. 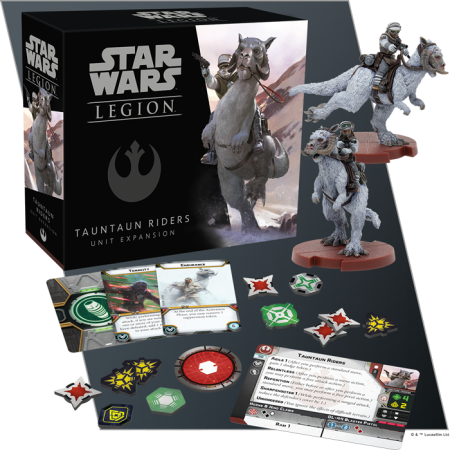 Fantasy Flight Games is excited to announce the Tauntaun Riders Unit Expansion for Star Wars: Legion! 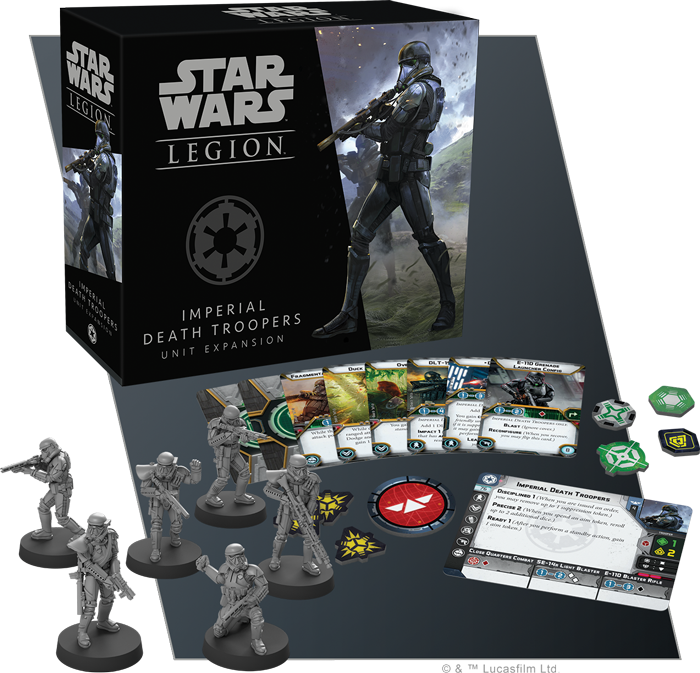 The odds are stacked against the Rebel Alliance in almost every confrontation with the Empire, but especially so for the Rebel’s special forces units. Often operating deep behind enemy lines, these elite operatives are accustomed to facing the full weight of the Imperial war machine without the support of a larger army. The Rebel Pathfinders show a particular dedication to the cause of the Rebellion, often volunteering for the most dangerous missions. Making extensive use of guerrilla tactics to infiltrate and liberate key areas, the spies, saboteurs, and assassins that make up these units draw on their vast experience to get the job done with little thought of the obstacles that may stand in their way. 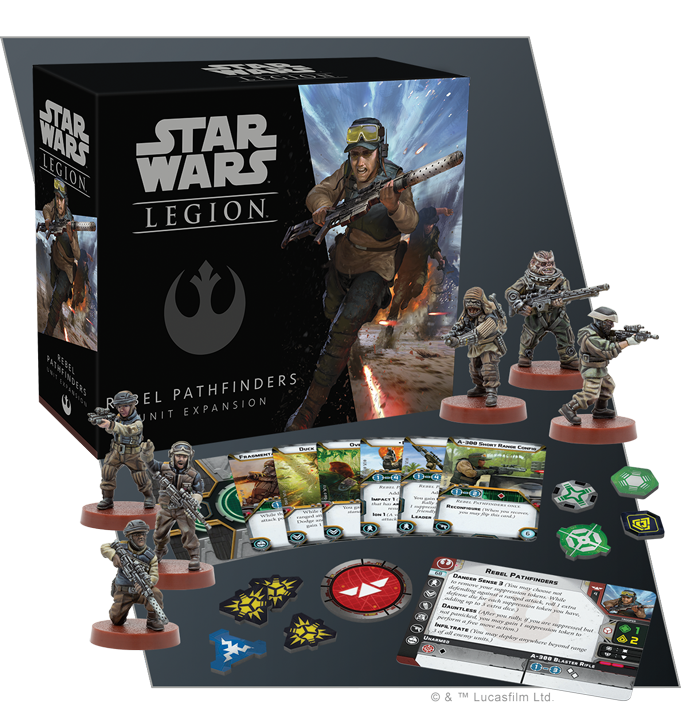 Soon, you’ll have some of the Rebellion’s best soldiers at your command with the Rebel Pathfinders Unit Expansion for Star Wars™: Legion. Within this expansion, you’ll find six unique, highly detailed miniatures. Four Rebel Pathfinders armed with A-300 blaster rifles are ready to do anything to keep the dream of the Rebellion alive, while Bistan and Pao are roaring into battle, ready to add some extra firepower with their heavy weapons. Adaptable and ready for anything, your Pathfinders can be further customized with eight upgrade cards that give you new options for how they attack, move across the battlefield, and more. Join us today as we take a look at everything included in the Rebel Pathfinders Unit Expansion! The Imperial All Terrain Scout Transport is a formidable war machine, cutting through Rebel lines as it stomps across the battlefields of the Galactic Civil War. Despite their appearance, however, these intimidating assault vehicles aren’t invincible. Soon you’ll find out what happens when one of these towering terrors comes crashing down. 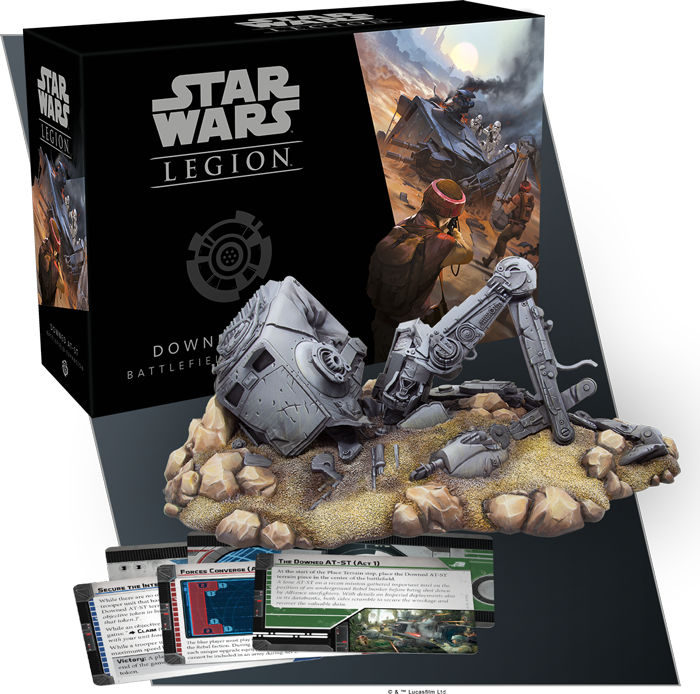 Fantasy Flight Games is proud to announce the Downed AT-ST Battlefield Expansion for Star Wars: Legion!